It's certainly the wrong time of the year for April Fool pranks. Chas Early of the Press Association, is reporting an odd event in Los Angeles this week and only time will tell whether it's a brilliant marketing ploy or simply 'dumb', but a new coffee shop in LA is certainly pulling in the punters. 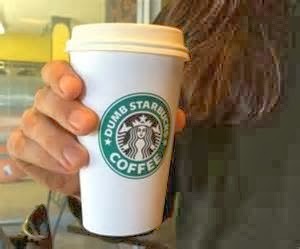 It's called 'Dumb Starbucks' - and is a virtual carbon-copy of one of the caffeine giant's familiar outlets, from its colour scheme, logo and menu through to the music it plays. 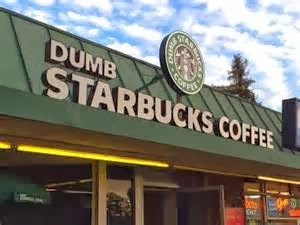 There's just one difference - the careful application of the word ''dumb'' at every point, in order to differentiate it from the real Starbucks. The menu, for instance, advertises 'Dumb Espresso' and 'Dumb Brewed Coffee', while CDs on sale at the counter include 'Dumb Jazz Standards' and an offering of 'Dumb Norah Jones'. Situated in the Los Feliz district of LA. the coffeehouse opened on Friday, giving away 'Dumb Iced Coffee' and 'Wuppy Duppy Lattes' to promote its business, and attracting a long line of customers. Many said they were attending for the novelty, to take a picture or to get their hands on a souvenir cup, assuming the venue would soon be shut down. Rumours circulated among the crowds about whether the shop was a marketing ploy, a piece of installationist art. or for a hidden camera TV show, reported the Los Angeles Times. It has also created a buzz on social media, with most users marvelling at the chutzpah of those behind the 'parody' store. 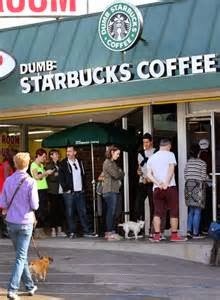 Laurel Harper, a spokesperson for the real Starbucks chain told a local radio station: 'It's obviously not a Starbucks. We are looking into it right now. 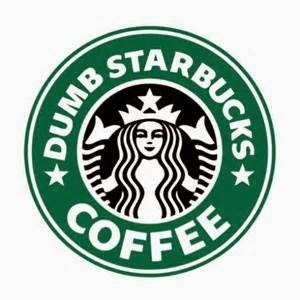 While we appreciate the humour, they cannot use our name, which is a protected trademark'' She added that most trademark disputes are handled informally, suggesting the company might not need to take legal action, though Starbucks had not yet succeeded in contacting those behind Dumb Starbucks.